Be the Groove is deeply committed to education and we strongly value sharing our fun and energizing technique with people of all backgrounds. In addition to performances, Be the Groove offers classes, workshops, and residencies focused on our unique combination of dance and percussion. Our ensemble’s goal is to motivate the development of teamwork and individual self-confidence through the language of rhythm and dance. Be the Groove’s teachers work with students of all ages and skill-levels, regardless of experience. While our classes generally focus on skill-building activities, they also foster teamwork, spontaneity, ensemble-building, self-confidence, healthy exercise and movement, and body awareness. Our classes are a great way to get kids motivated and moving, and to get people thinking on their feet! Now celebrating its 5th year, Be the Groove’s Collective Beat program is a great way to bring the groove to your school, library, or community center. Through percussion, dance, and participation, we ask our audience members to redefine what rhythm is, how it is made, and what role rhythm plays in their lives. 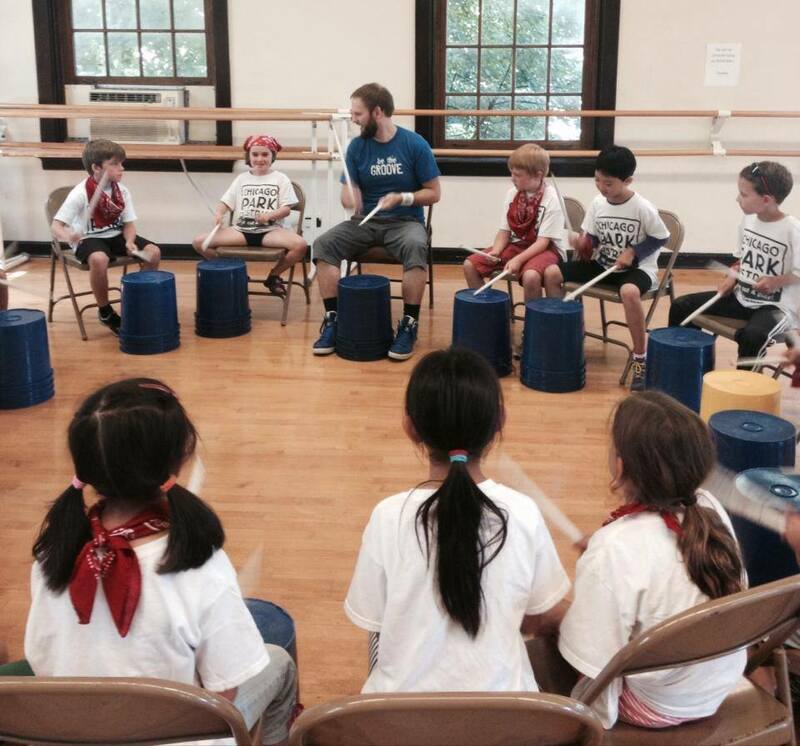 Collective Beat encourages learning through performance by challenging audience members to explore rhythm in a fun, educational, and interactive way, all while promoting the value of being an ensemble, a group working together. Featuring four BTG ensemble members, the performance examines why individuality is crucial to a group’s identity and how both “the parts” and “the whole” that make up any group are equally important. One theatrical piece highlights the realities of bullying in a musical and ultimately playful manner. Another spoken piece addresses the rhythms of our everyday lives by poetically exploring the challenges of pacing oneself. The performers push the audience towards being open to the unexpected, leading them to discover surprising things about the people and the world surrounding them. Be the Groove members also engage the audience with a few moments of participation—both with the full crowd and by selecting volunteers to come on stage—incorporating instructional moments that impart musical terms like “tempo” and “dynamics” to get students thinking critically about what they’re seeing and hearing. The goal is to stimulate the children’s perception of performance modes they are perhaps familiar with, while also challenging their understanding of the intricacies that underscore the tenants of music and dance. Collective Beat was specifically created to engage young people, to begin conversations about the arts, and to inspire audiences to consider new ways of applying rhythm to their everyday lives. The show’s high-energy blend of rhythmic choreography and technical drumming, in addition to vocal components like beatboxing and spoken-word poetry, appeal to students of any grade. 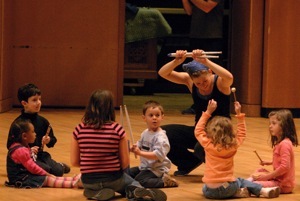 Each program is tailored to the specific age group of the audience. When coupled with workshops or a BTG residency, Collective Beat is an effective and illustrative introduction to the rhythmic arts, or it can stand alone as a comprehensive educational performance. Regardless of the setting, Collective Beat generates an exciting energy that will leave your group enthusiastic about rhythm and performance! “Communication for the event was great. I was impressed with how quickly [BTG was] able to accommodate my request for a student assembly. Introductory workshops cover a variety of rhythmic skills and concepts, offering basic technical in- struction while boosting personal confidence through soloing and emphasizing the importance of teamwork in a group environment. These classes offer unique BTG perspective on the movement and percussive skills students already possess. Masterclasses challenge students to apply their strong skill base to new mediums, with fresh attention to style. Generally reserved for intermediate to advanced students of movement and/or per- cussion, these sessions ideally take place in a studio environment with a mirror and proper flooring. These programs offer an extended, broad curriculum that thoroughly explores the foundations of rhythm and ensemble work. Classes may be structured around comprehensive BTG techniques or tar- get specific skills, styles or themes. Classes will build in complexity and can culminate with a short student-performed piece. If you don’t see a program that fits your specific needs, please ask us! We are happy to discuss how to tailor an educational program that is right for your group, and we look forward to working with you.